I wasn’t exactly sure what I was getting into when I started reading this, but 'The Kiss of Deception' was so much more intense than I’d expected it to be. Have you ever picked up a book, in the mood for a whimsical romance complete with drama, and then realized you were getting more than you bargained for? That’s what reading this book felt like; the fact that there was an immense plot behind the main character, Lia, a young girl looking for a little love, was what made this book so…serious. Yet beautiful. It’s been a while since I’ve encountered a book like this. The first book that comes to mind when thinking of possible relatives to this novel is 'Warrior Princess' by Allan Frewin Jones. Both were stories of princesses and fate, and both had the same fierceness to the plot and the MC. 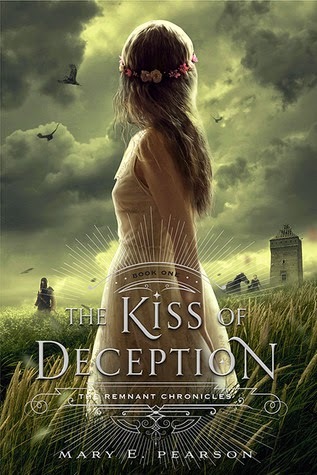 However, 'The Kiss of Deception' had more of a romantic base to it. Speaking of romance, the assassin and the prince? They were the most unique male heros I’ve ever encountered. I had the hardest time choosing between the two characters; none of them fit into the stereotypic “arrogant prick turns loving” category that I usually choose my favorite book boyfriends from. I’m sure one of the guys fit the category more than the other, but it was just so impossibly hard to tell which. After getting a little more than halfway through the novel, I finally picked a man for Lia, but new events kept piling onto each other and by the time I finished reading I was doubting my choice. I feel like Kaden, the assassin, is more the complicated boyfriend-type I usually root for, while Rafe, the prince, is this unusual combination between nice-guy and soft-pushy guy. I’m astounded that the author managed to create two of the most unique male characters the book world has ever seen! The world-building was breathtaking. It was incredible how we learned more about Lia and her world the further we got into the story. Each dialogue and thought increased our knowledge; it was surprisingly easy to see myself as Lia and to understand where she was coming from with all of her decisions. That doesn’t mean I agree with everything she did – she gives her love away too easily – but she always had a reason. This amazing world filled with warring kingdoms and dastardly plots was only enhanced by the paradoxical innocence and maturity of the main character. I’m not quite sure about how I feel about the ending. Almost none of the reader’s questions are answered, and he’s forced to wait another year to find out more. All of the characters are together once more, and many deceptions that the reader knew, but the characters didn’t, are revealed. There still isn’t a clear answer to who Lia chose, and while that has got my curiosity one edge, I can see why that would be a benefit in the next book. Personally, I thought the second half of the book was better than the first half, and going off of that, I’m hoping the second book, 'The Heart of Betrayal', will be even better than the first. 'The Kiss of Deception' is a consuming story about a girl trying to live her life the way she wishes, who then realizes that fate has other plans in store for her. I feel that fans of 'Graceling', The Arcana Chronicles, and other such fantasy novels will be the most likely to enjoy this book; it has the same gist to it. I sincerely believe that this is a well-written novel, and a great start to the author’s dabblings in high fantasy. Book Synopsis: In this timeless new trilogy about love and sacrifice, a princess must find her place in a reborn world.